Are You Single and Satisfied? During the adolescent years, teens learn to grow more independent of their parents and families and focus instead on social development. But millions of teens with social anxiety and shyness would much rather bypass this critical stage. Shy teens may want to break out of their shell but feel uncertain how to do so, or may be anxious about being judged by their peers. 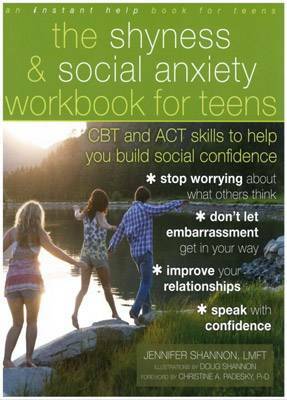 The Shyness and Social Anxiety Workbook for Teens offers a complete program based in cognitive behavioural therapy (CBT) and acceptance and commitment therapy (ACT) for helping teens break free from social anxiety and stop worrying about what others think. This book helps teens come to see that painful emotions, such as embarrassment, are inevitable and survivable. The comic-strip-style illustrations, exercises, and worksheets in this book address all aspects of social anxiety, from missing out on high school dances to going to job interviews. It also includes help for teens who have anxiety about blushing in public and speaking up in class. Jennifer Shannon, LMFT, is clinical director and cofounder of the Santa Rosa Center for Cognitive-Behavioral Therapy in Santa Rosa, CA. She is a diplomat of the Academy of Cognitive Therapy. Illustrator Doug Shannon is a freelance cartoonist and illustrator. His book, The Two Step, has been translated into several languages. He had a nationally syndicated cartoon strip called Claire and Weber from 1997 to 2000. Foreword writer Christine A. Padesky, PhD, is a clinical psychologist and director of the Center for Cognitive Therapy in Huntington Beach, CA. She has more than thirty years of experience using cognitive behavioural therapy and is co-author of Mind Over Mood and other books. Question: Why did you think it was important to write The Shyness and Social Anxiety Workbook for Teens? Jennifer Shannon: My own thirteen year old daughter developed social anxiety so severe that she refused to go to school. Understandably, she didn't want her mother as her therapist so I went looking for a book for teens with social anxiety that I could give to her. There were none, which surprised me, because social anxiety is the most common anxiety disorder, and the most common anxiety disorder, and the fourth most common mental health disorder. I know how important it is to have resources out there to help teens realise they are not alone and that there are things they can do to overcome this disorder. So I decided to write that book myself. Question: Why do some teenagers develop social anxiety? Jennifer Shannon: First of all, almost all teens have some social anxiety, for example fears about fitting in, being accepted and liked. So why do some teens develop social anxiety worse than others, to the point that they begin avoiding things like talking to people, going on dates, or group activities? The first possible cause is genetics. Just like other traits like brown eyes and curly hair, a tendency toward shyness can be passed on through generations. Second, the teen may have experienced an upsetting event, like being teased for having big ears, or forgetting their lines in a school play, and this can trigger more intense anxiety about being judged by others. And finally, it could be modeling by parents. For example if your parents are are shy and rarely socialise with others or are overly concerned with making a good impression, this may contribute to your social anxiety. Question: Can you explain how the workbook program works? Jennifer Shannon: My biggest goal is to simply help socially anxious teens know that they are not alone. When you realise that there are many others suffering as you are, you are more likely to get help. In the book, the steps to overcome social anxiety are laid out in a straightforward way. You identify how your thinking is causing you anxiety, practice thinking more realistically so that you begin to engage with people and face your fears instead of avoiding them, and finally becoming more resilient to situations where you may be criticised or judged to some extent. Question: Why was it important to set the book out, the way that you did? Jennifer Shannon: I really wanted this book to be something teens would pick up and read and wordy books can be a turnoff, not just for teens, but for many people. Also we all have different learning styles, the illustrations are great for visual learners. And I just happened to have a terrific illustrator as a husband, so that was very handy! Question: What advice do you have for teenagers to overcome their shyness? Jennifer Shannon: Shyness itself is not a bad thing. In fact shy people are often sensitive, thoughtful and good at understanding others. I have been shy my whole life. The important thing is to not let your shyness stop you from doing things you want to do, like meeting people, making friends, dating, and speaking in front of groups. The most common problem socially anxious people have is what I call social perfectionism. They think that they have to be smart, funny, interesting, to always know what to say, and never appear nervous. What I tell teens all the time is to lower the bar for yourself. Be willing to make mistakes, everyone else does. Once you develop more realistic expectations for yourself, it becomes a little easier to push yourself to face your fears and start living the life you want.